Although the Fujifilm X-T1 and Nikon Df might be quite different models in terms of their specification, they represent a very similar proposition in terms of their target market and ideology. In the X-T1 and Df, Nikon and Fujifilm have created cameras to meet the demand for a digital camera that handles like a film camera. Both of these models is a different answer to the same question, with each a pastiche of a 1970s film SLR. On the one side is a retro-looking DSLR with a full-frame sensor and a large optical viewfinder, and on the other is a smaller and lighter CSC with an APS-C-sized sensor and an EVF, with each offers an array of buttons and dials. But despite these differences, the two will be competing for the same purchaser when it comes to the shop floor, and if you’re looking for a premium retro camera which is best suited to your needs? When the Nikon Df was launched, it was the hope of many that the size of the camera would be more in keeping with the that of the company’s FM or FE film range. Better still, many hoped that the camera would match the 53mm depth of the smallest Nikon F-mount camera, the FG. Yet to produce something of this size with current technology is difficult. 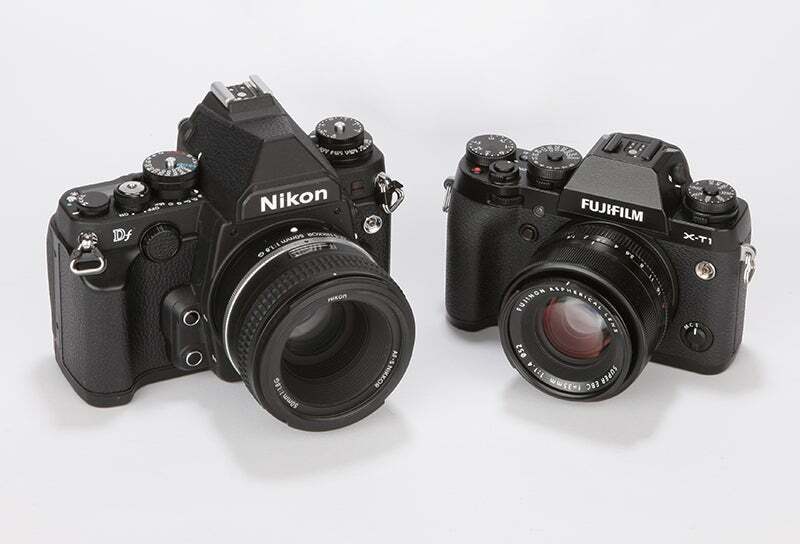 There is around a millimetre difference between the focal plane and the rear of the Nikon Df and Fuji X-T1 digital cameras. What makes these two cameras so different in size is due to what is happening in front of the sensor. In the case of the X-T1, there is no mirror mechanism. The back flange distance from the lens mount to the sensor is 17.7mm on the Fujifilm X mount. Compare this to the 46.5mm distance between the mount and focal plane on Nikon F-mount cameras. It is clear to see the difference that the SLR mechanism makes to the size of the camera. In fact, the flange back distance of the Nikon F is almost the same as the entire 47mm thickness of the X-T1 body. Take the handgrip out of the equation and the X-T1 is around 37mm thick, and it includes an articulated screen. There was some speculation that the Nikon Df would be a mirrorless F-mount camera. But, as we saw with the mirrorless Pentax K-01 K-mount CSC, the lack of a mirror makes little difference in size. The K-01 just felt like a DSLR, except without the optical viewfinder, leaving some to cruelly describe it as being rather like a brick.